– Compiled under the direction of Father Johann Roten, S.M. This index of material included in the All About Mary website, brings together resources that pertain to this feast. Additional resources may also be available by using the provided search tools. Describe the scriptural support for the dogma of Mary's Assumption. Like the dogma of Mary's Immaculate Conception, the dogma of the Assumption is not explicitly stated in the Bible. The teaching that 'at the end of her earthly course, Mary was assumed into heavenly glory, body and soul' was dogmatically defined by Pius XII in 1950 in Munificentissimus Deus. What does scripture tell us about Mary's life? What do we know about Mary's life from apocryphal sources? There are four Marian dogmas. It is often stated: As the Church prays, so she believes. The great prayer of the Liturgy aided the development of the doctrine of the Assumption. The following feature points to the evolution of Marian feasts in the recent past. It shows the feasts in vigor before the liturgical reform of 1969, the changes made in 1969, and the further developments of 1986. Does the liturgy give us any hints about Mary's life? Several events concerning Mary's life are commemorated during the yearly liturgical cycles of the Catholic, Orthodox and other Christian Churches. Introduction: Belief that Mary has been taken up and is now in heaven with both her body and her soul has been part of the teaching of the Catholic Church since the earliest centuries of Christianity. St. Alphonsus de Liguori is one among the saints who writes that Mary died for sheer longing and love of the Savior. Below is a quotation from his seventh discourse, "The Assumption of Mary"
Includes a section on the custom of bringing herbs for a blessing on the Assumption. How do religious names of flowers originate? Explain the 'Marian Year' celebrations. There was a Marian Year in 1950. It coincided with the proclamation of the Dogma of Mary's Assumption by Pope Pius XII. Why do we call Mary Queen? Assumption and Coronation must be sharply distinguished. 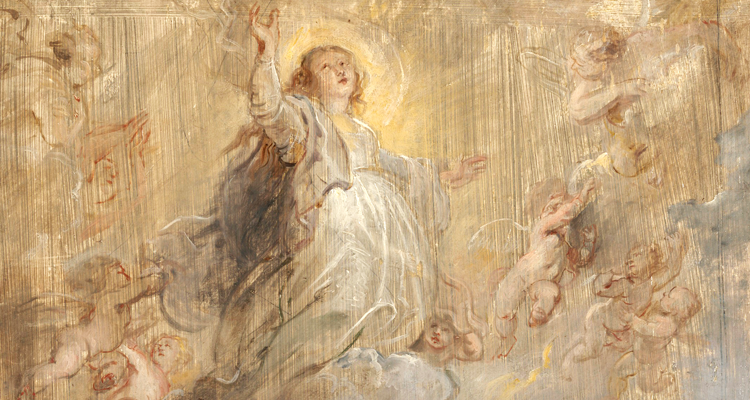 The following poems celebrate the mystery of Our Lady's Assumption. The reader will also find here poetry which explores the relationship between the season of summer and the Blessed Virgin's role in salvation history. Includes: "Assumpta est Maria en Coelum"
What are the fifteen symbols of the Immaculata represented on the famous tapestry of Our Lady in Reims, France? The famous tapestry of Our Lady in the Reims Cathedral comprises fifteen tableaux relating the life of Mary. What is the meaning of the crescent moon that Mary is sometimes pictured standing upon? Includes: The crescent appears under Mary's feet in paintings of the Assumption (Meister of the Luzien-Legende, 1485) and signifies her glory and victory over time and space. Marian Theology Tape 2 (Lecture by Anthony Tambasco), 100 min, 1990.